Since October 2016 i use now bigger tower, so higher system but the original placement of the sloper doesn’t allowed me to lift ants up than 13m high. So after 1 mounth of test , i have at least found a solution to have my tower completely pulled and a 160m system with a kind of half sloper working. Since 2013 ,for the Top Band , i use a Half Sloper originaly based on wd8dsb design but i have rectif it to some European dimensions and materials. 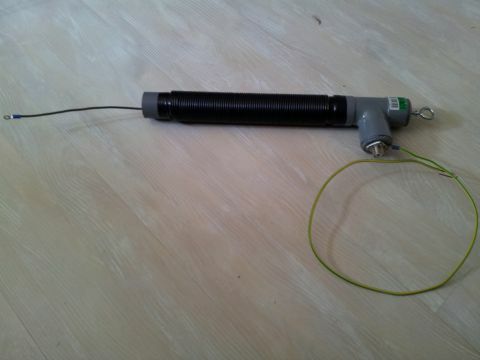 So since Jully 2013 , i use my « version 4 » , definitiv antenna design : with some 2.5mm² wire, coil 71 turns on 40mm PVC pipe + 19.3m slop wire until 1.5m ground on a insulate support. 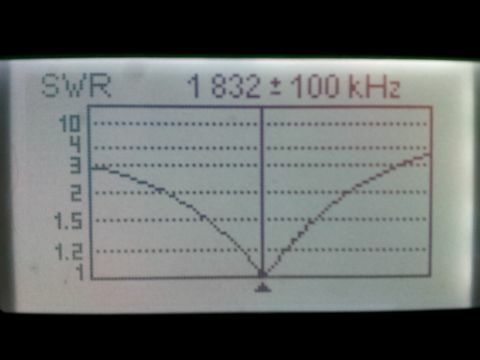 Nice SWR curve , 45Khz SWR under 1.5, 110Khz SWR under 2, 180Khz under 3 SWR. Tower need radials, i have add arround 30, lenght between 10 and 20m longs and do not forget that beams on the tower upper the sloper act as Hat-cap. Coil should be 41-44uH and arround 500Ohms react. So theorical value est near pratical value. 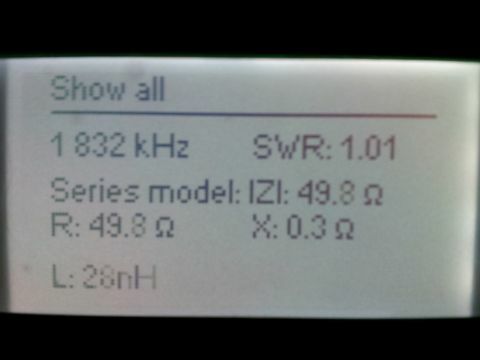 with 1.5mm2 on coil : 1620Khz / 1.2SWR . .. So i’ve redesign the antenna , it was my « 1st Prototyp » . So now need to found the good compromise with numbers of turn in the coil and lenght of the sloper wire to change Z and X. During tests ,40 radials, 10-20m longs are connected to the tower and grounded. RX is a bit noisy but gain is here, i ve done a french QSO on 1843Khz with ATU of the 756P3 cause Z is 13 Ohms … so 3.2 SWR. 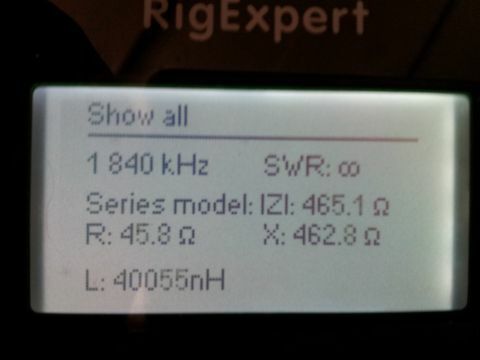 24 Feb 2013, Sloper is QRV… on band but 1.9 swr 1850… Z:27Ohms, X … high ! Too much capacity with slop wire. 27 Feb : so after few adjust 1.2swr 1820Khz , 68turns + 19.2m sloper untill 1.5m gnd… seems on good ways … but still some SWR, R 32 , X : 10. Must have a look reactiv and capacity. 28 Feb 2013 : New coil with less carbon, 65turns + 19.2m sloper untill 1.5m gnd 1.16swr 1840Khz .